Exploring the artistic expressions of the French Revolution. This print is in fact a combination of three etchings produced separately during the summer of 1789 to celebrate the overthrow of the political and social order in France following the Bastille’s fall and the legislative events of the night of 4th August. It seems probable that their juxtaposition by the publisher is not because they naturally belong together (only the central and right-hand image were ever paired as pendants, and they do not match the left-hand image visually or intellectually). Rather, their montage might stem from the publisher’s belief in their commercial potential: images of this type were extremely popular. The colouring is quite crudely executed suggesting that the print would have been intended for mass production and dissemination at a modest price. The figures represented in each of the scenes are embodiments of the Three Estates. The First Estate (the clergy) is identifiable by his priestly garments and crucifix, the Second Estate (the nobility) by his sword and extravagant attire, and the Third (everyone else) by humble dress and the tools with which he tills the land. At the time of the print’s production, artists sought ways of representing the changing relationships between the orders in revolutionary France, employing metaphors provided by music, food, dance, and children’s games to help visualise essentially abstract ideas. In the central image A faut esperer qu ca finira ben tot (I’ve got to hope that I’ll be done soon) the engraver has chosen a backbreaking game of piggyback to allegorise the inequalities of the ancien régime, depicting the character representing the Third Estate – a peasant – single-handedly supporting the others through his labour. Bent double under the weight of the burden, his hoe doubles up as a prop. 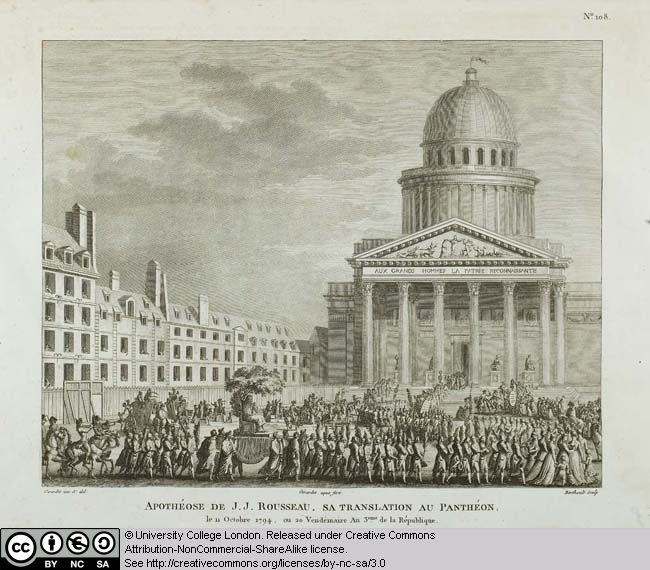 In the right-hand image J savait ben qu’jaurions not tour (I knew that we would soon have our turn) we see the tables turned and the First and Second Estates subjected to the treatment long endured by the Third, who is now carried aloft. The fact that he has killed the birds and caught the rabbit that nibbled at his crops in the central image (a reference to his new-found hunting rights, previously reserved for the second estate) is another sign of his triumph. Clues found among their dress and props inform the viewer that the coming of the Revolution can be credited with this reversal in fortunes: all three wear the tricolour cockade for instance. Whereas the right-hand image gleefully showed the first two Estates humiliated and subjugated, the image on the left La Paix et la Concorde font la Prosperite des empires (Peace and harmony make empires prosper), depicts equality between the three orders. Each of them step beyond their prejudices and privileges (inscribed on papers beneath their feet) to unite in a single unit. The caption above their heads simply reads ‘Réunion des trois ordres’ ( Reunion of the three estates) . In fact all three images contain much verbal material which helps convey the print’s message in considerable detail, reducing the risk of misinterpretation by its audience. Over the summer of 1789 thousands of printed journals and news sheets poured from the French presses as journalists and pamphleteers sought to take advantage of the public’s demand for news from Paris. This dramatic expansion of the press was not only the result of increased demand, but can be attributed to the recent loss of government control over the printing industry. Whereas under the ancien régime the French press had been vigorously licensed and subject to heavy censorship and control, the libertarian, anti-authoritarian atmosphere of ’89 now encouraged people to print politically-infused, often subversive material for public distribution. Although the authorities might target individuals accused of disseminating anti-governmental texts, broadly speaking they were powerless to stem the tide of such publications. For the first time the press was essentially free. The emergence of a free press in France was a development of immense importance, for it was through the unimpeded distribution of printed political material of varying types that French citizens across the nation became enfranchised. In any number of printed sources then circulating, a reader could access, for example, transcriptions of the debates being conducted in the National Assembly and learn of the laws being passed there. However, although such journals had the potential to be a line of communication between governmental deputies and the people, it was feared that they might also obscure and pervert that relationship. Many papers had strong editorial voices and it was feared that readers might be vulnerable to manipulation. For example, readers risked imbibing Marat’s radical politics as they read the latest reports in his journal, L’Ami du Peuple. 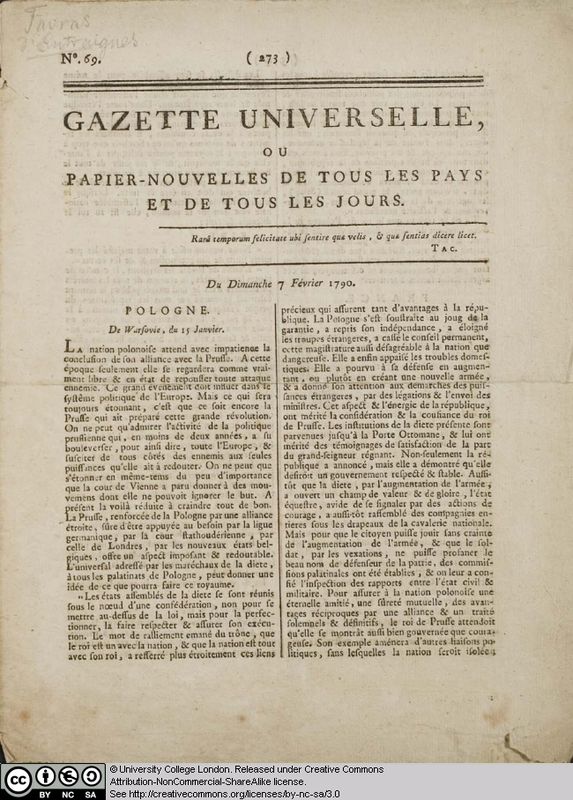 The Gazette Universelle, a daily paper first published in December 1789, claimed to have no agenda – ‘we are, and we only want to be historians’, wrote its editor in the Gazette’s prospectus. Yet this is not entirely born out by its tone of reporting or by its choice of subjects and Jeremy Popkin has characterised the Gazette as moderate in its orientation and appeal. 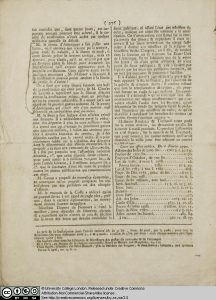 This edition, dated 7th February 1790, contains three separate articles and a brief account of the morning’s debate in the National Assembly. The Gazette, which was especially notable for its extensive coverage of international events (an emphasis stressed by the paper’s subtitle), opens with a report detailing Poland’s hopes following its alliance with the mighty Prussia – namely that it will be in a better state to defend itself against its aggressors. The other two articles concern home-news. The first details the rapturous public response to Louis XVI’s statement in support of the Constitution, pronounced in the National Assembly that morning. The second concerns the trial of the Marquis de Favras, who stood accused of plotting to abduct the king with the intention of smuggling him over the border to safety. The short article details the cross-examination of two witnesses, Monsieur l’abbé d’Eymar, and Marquis de Mirabeau. 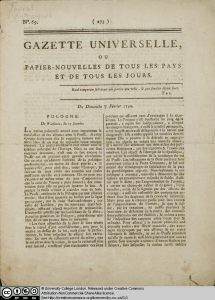 The price of an annual subscription to the Gazette Universelle is listed at the bottom of the pamphlet as 36 livres, which represented a considerable sum in 1790. This put a subscription to the Gazette beyond the reach of all those with modest incomes. Yet its readership was not necessarily so restricted for it could also be found in cafés and patriotic clubs that held a subscription. Additionally, the habit of reading aloud from journals meant that every copy bought could serve dozens of individuals, not all of whom needed to be literate. 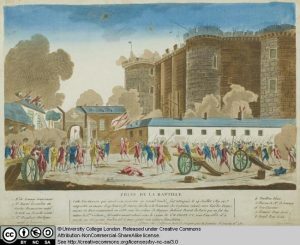 This print, with its key and short text outlining the history of the Bastille purports to educate its viewers about what took place on 14th July 1789 and to place the events within a historical framework. Yet we cannot read it as a dispassionate account of the Bastille’s capture. Rather this print belongs to a large body of imagery that sought to glorify and give epic status to an event that, in itself, was of limited significance. The importance of the fall of the Bastille was largely symbolic, for it was easily interpreted as a sign of the French people’s triumph over the forces of despotism. 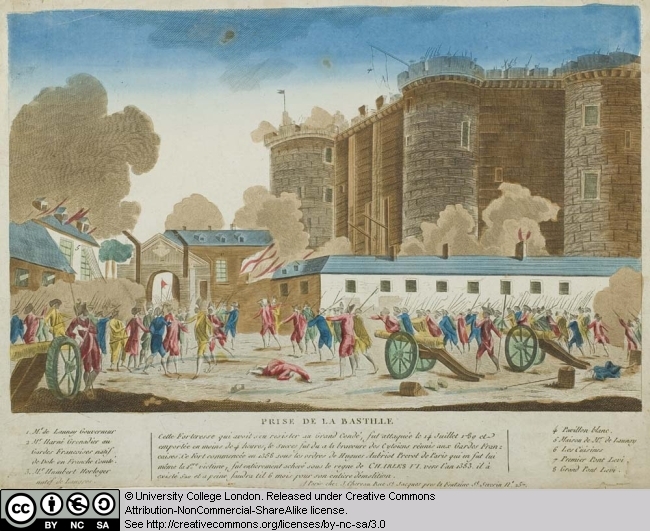 The text accompanying the image heroises the achievements of the French civilians and guard by comparing their swift victory to the failure of Le Grand Condé (a celebrated seventeenth-century military leader) to capture the castle. The success of the French civilians is attributed to their collective bravery, portrayed in the action-packed image, in which the crowd of courageous French men, armed with guns, bayonets, scythes and pikes, mount their attack on the Bastille, whose enormous form looms over them. The prominence of the cannons, billowing clouds of gun smoke and the bodies of three men in the foreground convey the violence of the episode, which claimed many lives. 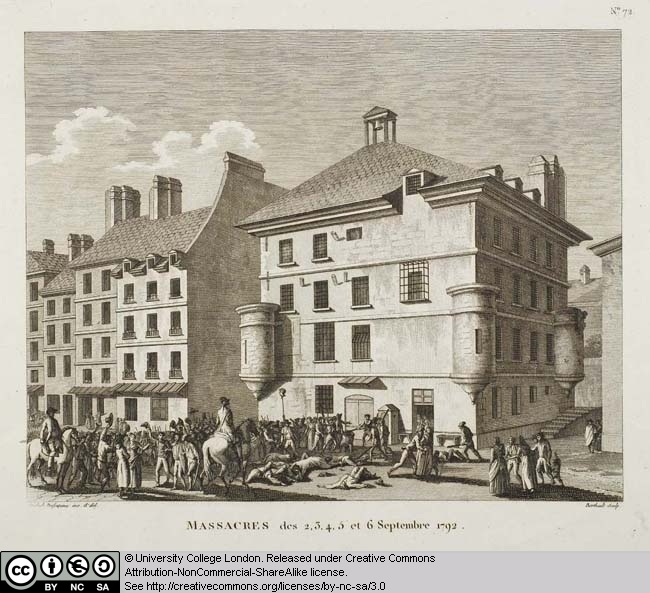 The printmaker has sought to draw our attention to a drama unfolding in the midst of this chaotic scene, focusing our attention on the arrest of the Marquis de Launay, the Governor of the Bastille, by Harné, a grenadier in the French Guard, and Humbert, a watchmaker. All three are identified in the key, numbered 1 to 3. Harné and Humbert were often singled out from amongst their fellow Vainqueurs de la Bastille (conquerors of the Bastille), for supposedly having been the first across its drawbridge and for having arrested de Launay (who was subsequently lynched by the crowd). 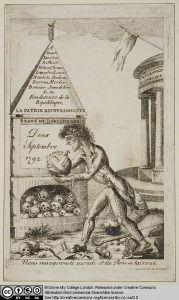 Edmund Burke’s Reflections on the Revolution in France was published on 1st November 1790 and provoked an extraordinary number of responses including this print that was produced the very next day. Print publishers in England such as William Holland, who published this caricature, and many others of the period, were eager to exploit the sensational events, especially those occurring in England. 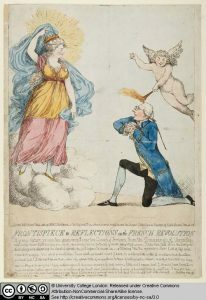 In this caricature, recently attributed to Frederick George Byron, Edmund Burke is represented kneeling before Marie Antoinette, Queen of France. Dressed in robes reminiscent of a Greek goddess and standing upon a cloud, Marie Antoinette is the subject of Burke’s enraptured gaze. Burke is here ridiculed for the admiration he displayed for Marie Antoinette in Reflections on the Revolution in France. 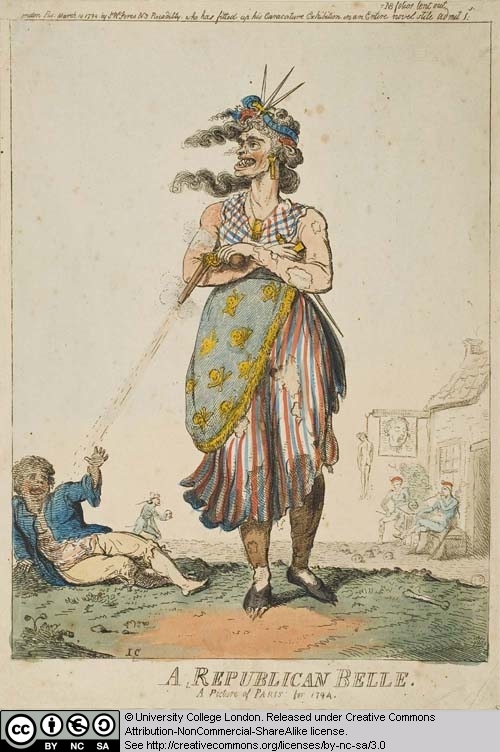 The caricature picks out the famous passage, beginning, ‘It is now sixteen years since I saw the Queen of France’ and ends with ‘I thought ten thousand swords must have leaped from their scabbards to avenge even a look that threatened her with insult – But the age of Chivalry is gone.’ Several months prior to its publication, Burke had sent a draft to Philip Frances, a British Statesman and Pamphleteer, who said of this passage, “all that you say of the Queen is pure foppery.” Caricaturists wishing to sway people against Burke and his opinions on the Revolution were quick to mock the praise lavished by him on the Queen. This engraving presents the viewer with a warm and sympathetic representation of an elderly (but in no sense decrepit) sans-culotte who is depicted reacting with quiet amusement to the games of a playful cat who toys with her ball of wool, forcing her to momentarily suspend her knitting. It is a homely and seemingly natural scene, but one nonetheless loaded with information that helps us reconstruct the politics and character of Madame sans Culotte. Her generic name and the fact that she is dressed in the colours of the tricolour identify her as an allegorical figure rather than an individual and she embodies the archetypal traits of the patriotic revolutionary woman. The scene is set in a poor but respectable home that shows the evidence of her domestic labour: behind her hangs a washed sheet put out to dry. Yet as well as being a dutiful housewife, she is constructed as an exemplary patriot and for instance, we see her knitting a liberty bonnet , perhaps for use by her husband or son. Interestingly, she does not wear the cap but a red scarf that mimics its appearance. This can be explained by the fact that the wearing of the liberty bonnet by women was widely regarded as improper and even, (somewhat paradoxically), counter-revolutionary. Madame sans Culotte then, does not overstep this boundary but works within it. The cat is also a significant inclusion. In addition to its role in the domestic narrative it also functions as the allegorical attribute of Madame sans Culotte , as well as serving as a narrative tool. 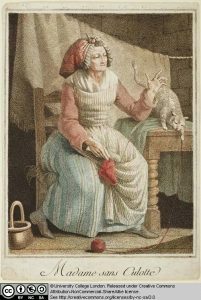 Traditionally a symbol of liberty, the cat may be intended to convey the idea that although Madame has the freedom to come and go, she chooses to conduct her patriotic and domestic duties from home. At a time when worries were being expressed about the consequences of women’s new-found independence – the home deserted, children abandoned – this would have been readily interpreted as a sign of her virtue. The quality of the print suggests that it was intended for an audience belonging to a higher financial bracket than Madame herself, and that it would have had a relatively limited distribution. A companion piece depicting her male counterpart Le Bon sans Culotte was also available from the same engraver. The event depicted in this caricature occurred mere days prior to its publication on January 1st 1793. 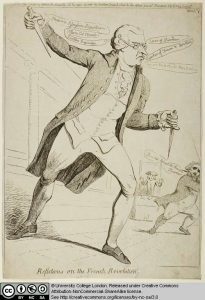 On December 28th 1792, while debating the Alien Bill in the House of Commons, Edmund Burke, author of the critical Reflections on the Revolution in France , produced a dagger and exclaimed that this was what Britain could expect from France. In his speech Burke said that it was his aim ‘to keep the French infection from this country; their principles from our minds and their daggers from our hearts.’ This incident marked the public break between Charles James Fox and Edmund Burke, both of whom where politically aligned to the Whigs but whose very differing views on the Revolution led to the demise of their professional and personal relationship. In this caricature, Cruikshank portrays a giant Burke with a dagger in each hand standing outside the House of Commons. Words in speech bubbles spill from his mouth including ‘Levellers’ ‘Plunderers’ ‘Assassins’ and ‘Republicans’ and are representative of his views of the French. Charles James Fox is seen fleeing on the right, typically represented as unshaven and plump, while speaker of the House of Commons Henry Addington can be seen in the background. Propaganda campaigns against radicalism were organised in England as news of the September Massacres, the deposition of Louis XVI and the proclamation that France was a Republic made its way across the Channel. One of the most popular associations was created by John Reeves, a lawyer and colonial administrator, who was alarmed by the seditious activity that he believed threatened to undermine the British constitution. In November 1792 he established the Association for Preserving Liberty and Property against Republicans and Levellers at the Crown and Anchor Tavern in London. Its aim was to counteract the effects of radical literature inspired by events in France. It soon became the largest political organisation in the country, with branches throughout England. Similar societies were founded and had an immediate impact in suppressing radicalism. Reeves’ London organisation produced and distributed many of the best political pamphlets at this time. Their agenda was to contrast the political anarchy in France with tranquil British life. This print The Contrast/Which is Best was copied from a previous design by caricaturist Thomas Rowlandson in 1792 and was published on behalf of Reeves’ association. 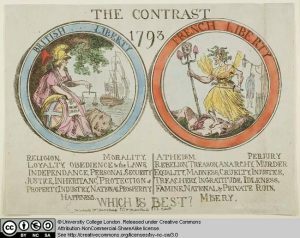 Here, the notion of liberty is symbolized by two contrasting female figures. A serene Britannia is represented on the left, holding the scales of justice, a staff with the red Phrygian cap of liberty (significantly transferred from France to England), and the Magna Carta while guarded by the British lion. On the right, the French figure of Liberty is a savage Medusa, surrounded by death and destruction. This design was one of the most widely distributed by John Reeves’ association. As the price line suggests it could be bought by the hundred at one guinea plain and two guineas coloured and was most often dispatched with specific orders to place it in pubs and barber’s shops. In this English caricature, Cruikshank contrasts the Frenchman’s savage situation during the Revolution to the peaceful and plentiful circumstances of the Englishman. On the left, four famished Frenchmen, dressed in tattered clothing, are tugging at a single frog. Images of death and violence surround them, in particular the crucifix that now serves to hold a rope and a dagger, while through the window one can make out a man hanging by his neck and a head at the end of a pike. On the ground a ‘Tree of Liberty’, a symbol often used in revolutionary festivals, is gnawed at by mice. A cat dying of hunger reaches for a mouse but is too weak to catch it, while a bird dies in its cage. 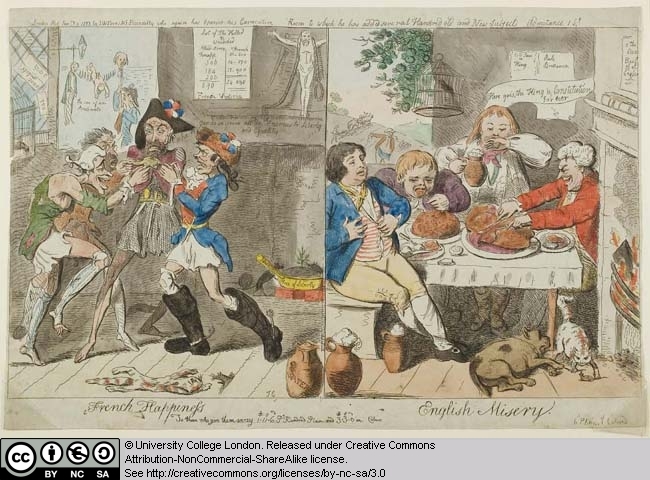 Cruikshank contrasts this scene with the four healthy Englishmen to the right. Even the animals on the ground are well fed and plump, as the men at the table devour legs of ham or beef. Through the window, the prosperous English countryside, lush with vegetation, can be seen. 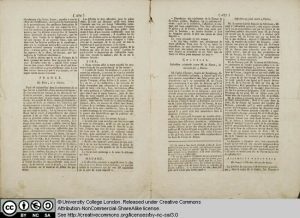 The method of dividing a print into two sections and contrasting the oppressed, starving Frenchman to John Bull or Jack Roast Beef was popular during this period. It was important to the governing classes that the people of England see how Revolution could turn the usually civilized population into savages. 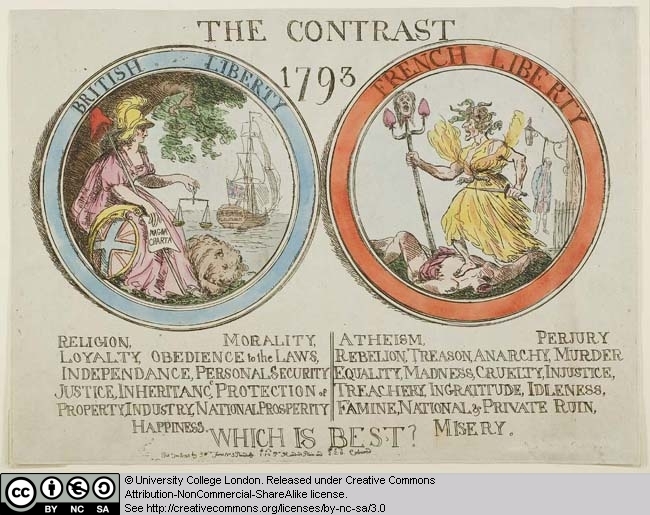 The idea for, and two-part structure of, this particular print may have come from a 1792 caricature by James Gillray where contradictions between the two countries were depicted as just as distinct as they are in French Happiness, English Misery. 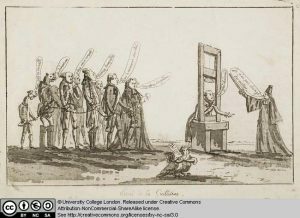 This caricature represents the execution of King Louis XVI in 1793. Louis was condemned and sentenced to death by the National Convention on January 17 1793. Four days later, on 21 January he was executed by guillotine in a public spectacle attended by cheering crowds. 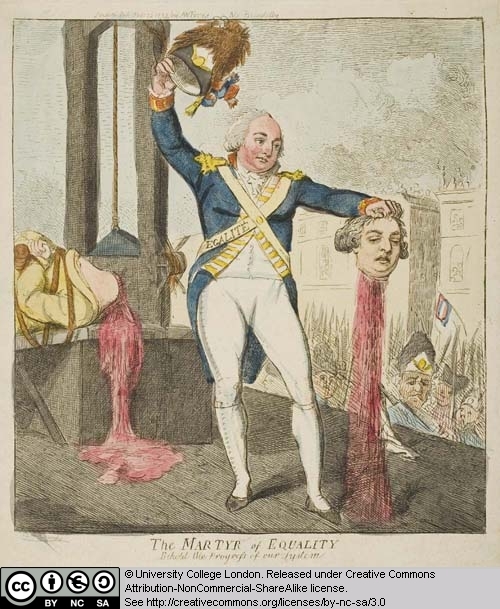 In Isaac Cruikshank’s caricature, published less than a month after Louis XVI’s death, the focus is not only on the gruesome execution by guillotine, but also on Louis XVI’s cousin, the former Duke of Orleans. He was one of the signatories who condemned Louis to death and stands to the side of the guillotine holding the head of Louis. The title, The Martyr of Equality, is a pun on the Duke’s new revolutionary name, Philippe Egalité. Despite the initial sympathy of many of the British people to the French Revolution, as the political violence increased in 1792 and 1793, during the September Massacres and the Terror, the British Establishment began to fear that vicious revolutionary tendencies might spread to their own country. Prints began to reflect a negative attitude towards the Revolution. The liberty cap, an icon used frequently in early pro-revolutionary propaganda to reflect the new Republic, was replaced by the frightening guillotine as the predominant symbol of the French Revolution after the execution of Louis XVI in 1793. 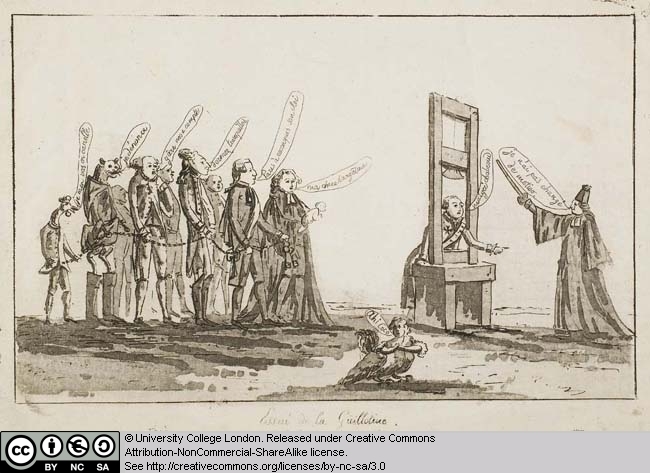 Images of the guillotine in use were issued in their thousands in England and were used as a shock tactic to show the British people the dangers and horrors of Revolution. In the months following Charlotte Corday’s execution for the murder of Marat, images of her that stressed her beauty, virtue and stoicism began to appear in the moderate press. These constructed her as a saviour who had rid the nation of a terrible monster. Such images were unequivocally denounced by followers of Marat who, fearful of a cult forming around Corday, wanted the memory of her consigned to oblivion. Yet the popularity of such prints was hard to suppress given that she had actively set about the construction of her own legend during her trial and imprisonment. This legend not only survived the immediate aftermath of her actions but endured throughout the nineteenth century. The curve of Corday’s breast is carefully delineated by the engraver, which draws our attention to her youthful feminine charms (another talking point), and serves to construct her as a nurturing, perhaps even maternal figure. This is at odds with the fact that a post-mortem revealed she was a virgin, a point used by the radical left to denounce her as ‘unnatural’. Although French women married at an average age of 24-26, and Corday’s virginity was not in any way exceptional, according to revolutionary rhetoric, a woman should have produced a brood of little revolutionaries by the age of twenty-five. 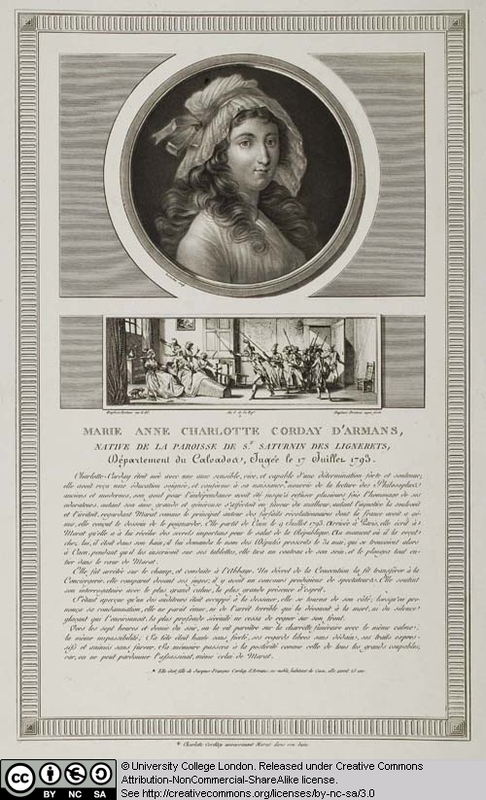 The inclusion of her full Christian name, Marie-Anne-Charlotte is perhaps significant in this respect. It evokes that other paradoxical virgin, the Holy mother Mary, and places Charlotte’s character and actions under her protection. Corday’s full name also evokes the Republic’s emblem, Marianne, the goddess of French liberty. 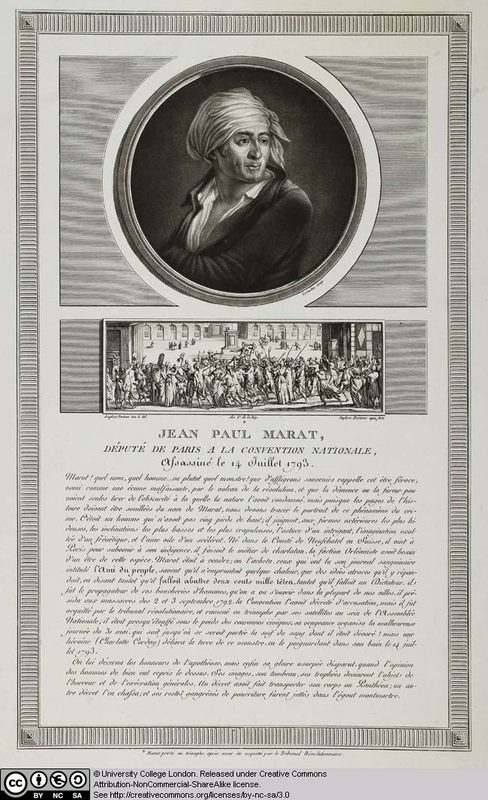 This print was one of a pair, and the publication line specifies that a portrait of Marat in the same size and format will be published within two months. Might the order in which they were published suggest that, among the publisher’s clientèle, there was a greater demand for a portrait of Corday, than for the one of Marat? This is a highly enigmatic print whose meaning has become obscured over time, although we can assume that it would have been obvious to its originally intended audience. 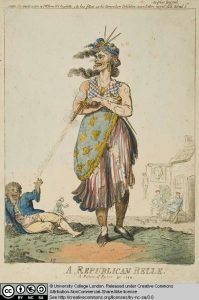 It is probable, for example, that members of the crowd (cockerel and puss-in-boots excepted) were caricatures of well-known personages yet today their identities remain ambiguous. The only exceptions might be Louis XVI with his head beneath the guillotine and the fourth and fifth figures from the left who, on the basis of their physiognomy we might guess are caricatures of Lafayette and Bailly, (once commander of the National Guard and Mayor of Paris, respectively). Their speech-bubbles do not help clarify their identity, nor do they explain the nature of the scene depicted, in part as a result of their deployment of slang and ambiguous references. The dialogue between the figure of Louis XVI and a lawyer (recognisable from his dress and baton) is particularly puzzling: the lawyer states to the king: ‘I have not changed my profession’, to which Louis replies simply, ‘despite Chabroud?’ This is surely a reference to Jean-Baptiste-Charles Chabroud, one time president of the National Assembly and advocate of legal reforms who sought to limit the powers of the king through the nomination of judges. Yet the exact meaning of their exchange remains unknown. The print’s joke would seem to be at the expense of the crowd of men who watch the king go to his death whilst making callous remarks. One of them (Lafayette?) says ‘dormez tranquillez’ – sleep well; another (Bailly?) notes ‘Paris a reconquis son roi’ – Paris has re-conquered its king. Yet they do not appear to notice that, manacled at the wrist, they are next in line for the chop. It seems possible, therefore, that this print was counter-revolutionary in character, mocking those who tried to control the Revolution’s early development and who are now about to be consumed by the monster they created. Yet a counter-revolutionary reading of the print is compromised by the inclusion of a strange creature in its foreground who, at the sight of the king’s execution, cries out ‘Ahi Coco’, ‘Ah, villain’. This half-bird, half-woman might be a caricature of Marie Antoinette, who was sometimes depicted as an ostrich (une autruche), a word play on her status as ‘l’Autrician’ – the Austrian. 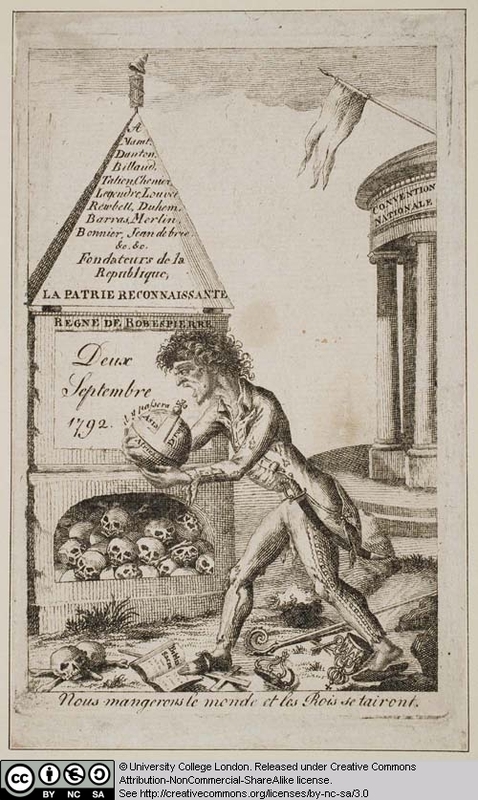 This caricature also took root in the popular imagination because it was believed that, like the bird, she had buried her head in the sand, remaining oblivious to the suffering endured by the French people and to the need to reform the monarchy. Surely a counter-revolutionary (and therefore presumably pro-monarchy) audience would not be receptive to seeing the queen thus defamed? The exact politics of the print (and its audience) therefore remain uncertain and open to interpretation. 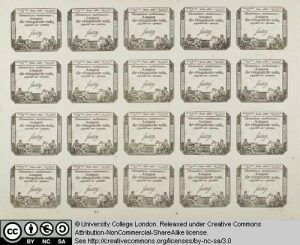 As Richard Taws has noted in his recent PhD thesis, assignats – paper banknotes of various denominations – were the most widely circulated form of print in revolutionary France, playing a vital role in the transmission of the Revolution’s symbols across the land. The relatively low value of the notes on this uncut sheet would inevitably have meant that most French men and women would have owned such a ‘print’ at various points, although their possession of them would inevitably have been brief. The terrifying speed with which the value of the assignat depreciated would have made people eager to dispose of them as quickly as possible in exchange for goods with more tangible value. In common with other assignats, these fifty sol notes are composed of a frame containing, at the top, a mechanically generated serial number and a date (in both the Gregorian and Republican calendars). The reference made to the law of 23rd May 1793 recalls the ruling that increased the circulation of these notes, which had in fact been in circulation since 1792. On the sides are warnings against counterfeiting assignats (a crime punishable by death) and encouragement to inform against anyone guilty of having done so. The pictorial information contained within the frame reinforces the rule of law through the depiction of appropriately accessorised allegorical figures. Of the two women seated at the bottom of the note, the one on the left is depicted writing the Rights of Man, the manifesto embodying the principles of the Revolution published in 1791. At her feet sits a cockerel, symbol of vigilance and wakefulness (in this instance against the violation of those rights). The woman on the right embodies justice and fraternity, symbolised by the pair of scales that she holds in one hand and the fasces (a bundle of bound rods) in the other. Look closely and above them you will see two timbres sec, embossed, inkless stamps, the one bearing the image of a winged man and the inscription ‘Règne de la Loi’, ‘the rule of law’, the other a female figure armed with the sword and scales of justice. Beside her sits a tablet simply engraved with the word ‘loi’. Perhaps these virtuous figures were chosen from the pantheon of revolutionary deities to try and deter the host of forgers who were quickening the assignat’s depreciation. On a more practical note, it was hoped the use of very detailed engravings and timbres sec would reduce the chance of being able to successfully counterfeit the note. The denomination of the note is specified within the frame alongside the printed signature of Saussay. Signatories were not usually chosen because they were important individuals – the equivalent of the governor of the bank of England, for instance – but because of the beauty of their handwriting! It is likely that Saussay was a low ranking bureaucrat. The note’s header, ‘Domaines nationaux’ (National property) is a reference to the fact that the note’s value was derived from the capital raised by the recent nationalisation of all church land. As such, ownership of the note was theoretically akin to ownership of a share of that nationalised land. The design of this complex political allegory by Jacques-Louis David, without doubt the most celebrated artist of the French Revolution, was originally intended to decorate the curtain of the Théatre des Arts. However, his ambitious plan was never realised – if it had not already been abandoned, the fall of Robespierre in July 1794 would certainly have rendered it impolitic for a post-terror regime – and like so many other revolutionary projects it remained on paper only. The focal point of this crowded print, whose large cast of characters progress across the picture plane creating a frieze-like effect, is the figure of the triumphant French people embodied by a crowned figure of Hercules. He is carried aloft on a richly ornamented chariot similar to those designed by David for inclusion in the revolutionary processions that he orchestrated on behalf of the government. Typically, David has drawn directly on classical sources when composing this image, and both the chariot and its occupant are direct quotations from an antique source – a Roman sculpted sardonyx known as the Gemma Augustaea. Hercules shares the float with the allegorical figures Liberty and Equality, who rest between his knees, and with the embodiments of (from left to right), Commerce, Science, Art, and Abundance, identifiable by the attributes they bear. All four, the print suggests, flourish under the protection of the triumphant French people. 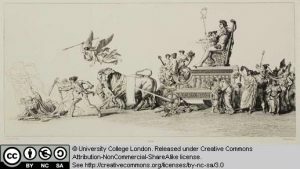 Running before the chariot, which crushes emblems of feudalism, royalty, and superstition beneath its wheels are two sans-culottes attacking the figures of fallen kings who stumble at their approach: hovering above them is a winged figure personifying victory. A crowd of republican heroes, both ancient and modern, follows the chariot, among them, the Gracchie brothers, Brutus, and William Tell and, from the pantheon of French revolutionary martyrs, Marat, Le Peletier and Chalier. Each one carries the weapon used to kill him or exhibits his wounds. Chalier holds a guillotine blade aloft, and a particularly startling inclusion is the figure of Jean-Paul Marat, who breaks away from the procession, lunging towards the viewer to whom he exposes his fatal stab wound. 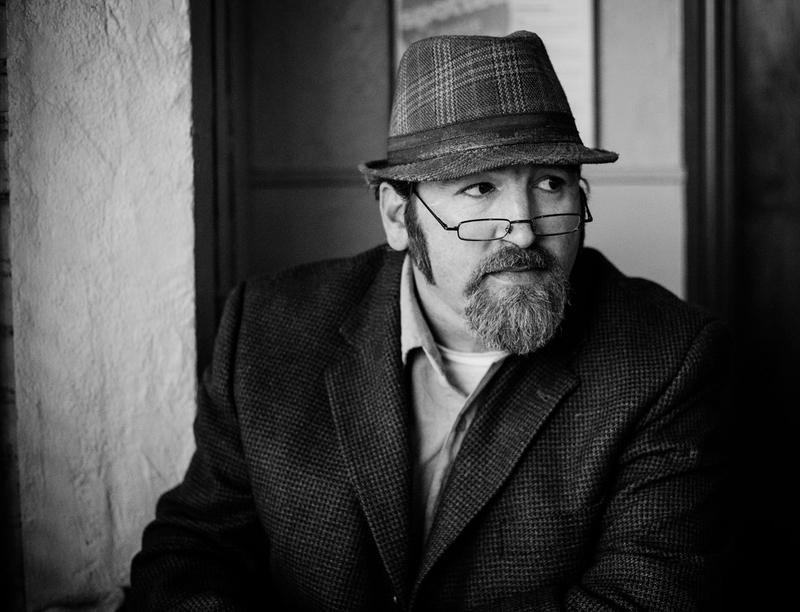 Here David draws on age-old conventions for the depiction of Christian saints, conventions that would have seemed especially pertinent given that the revolutionary martyrs were themselves the subjects of huge cults. 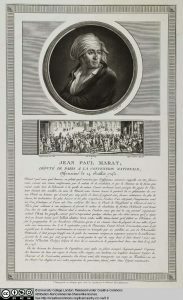 Jean Paul Marat was the deputy of the Convention and publisher of the newspaper L’Ami du Peuple. During the Revolution he had denounced many of his fellow deputies, had called for a temporary dictatorship and advocated greater use of the guillotine in order for the Republic to survive. On July 13th 1793, on the eve of the fourth anniversary of the fall of the Bastille, Charlotte Corday stabbed Marat in his bathtub. By July 22nd news of the assassination had already reached England and Corday became an instant celebrity. French and English artists portrayed the two individuals involved quite differently. In French depictions, Marat was portrayed as a martyr, a modern-day Brutus who helped slay the King. However, in England, and for counter-revolutionaries, Charlotte Corday became the modern-day Brutus, having assassinated a blood-thirsty despot. This stipple engraving of Marat’s assassination had quite different intentions from the caricatures published during this period. Indeed its technique, which was more complex and took longer to produce than an etched caricature, together with its text in both English and French was aimed at a more sophisticated and educated class of consumers. 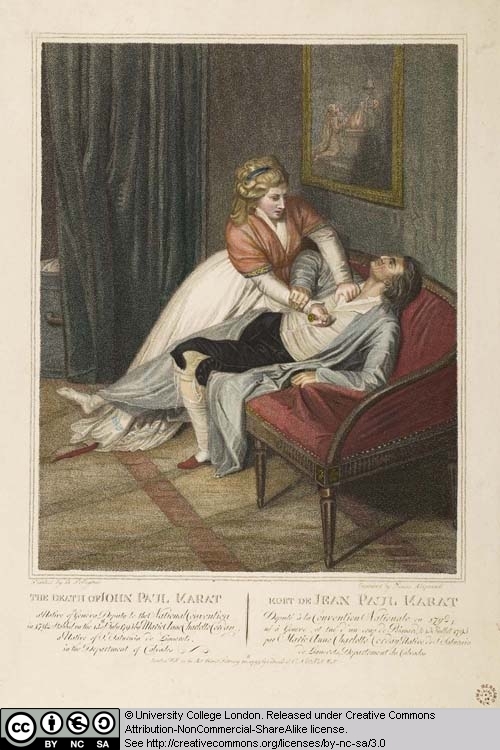 The engraving was published some eight months after the murder and it is possible that while the news of Marat’s death had made it to England, details of how the assassination occurred may not have been included. The inaccuracy of Charlotte Corday stabbing Marat on a chaise longue rather than in the bath may have been intended simply to add to her heroic stature. 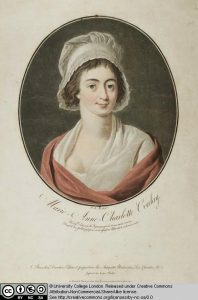 The chaise longue, a tool of seduction, also intensifies the narrative of virtue and vice, and suggests that Corday is preserving her own and the country’s virtue. The bathtub may be just visible on the left, behind the heavy draped curtain. Published as a pair A Republican Beau and A Republican Belle satirized the popular French fashion plates of the period, while continuing a trend in other British caricature to portray the French Revolution as a society turned upside-down. 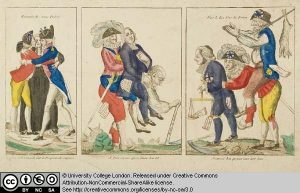 In France sans-culottes were viewed as zealous revolutionaries or patriotic fathers, but in England they were portrayed in caricatures as violent sub-humans whose animalistic behaviour was overturning both the French monarchy and their own civilisation. 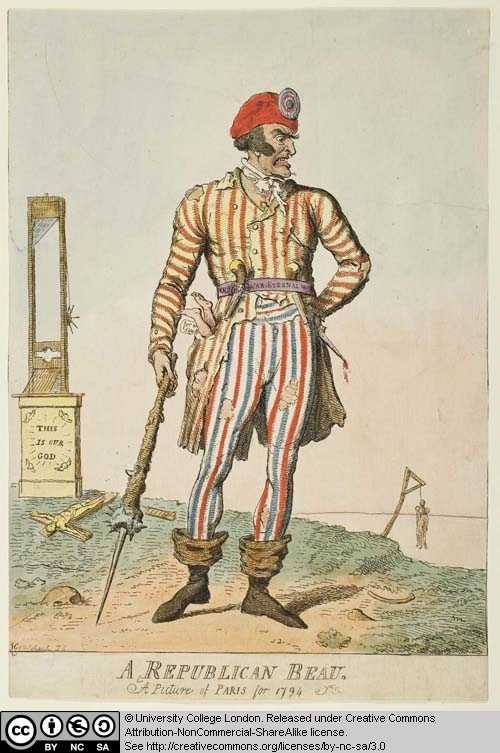 These caricatures were published during the height of the Terror when thousands were sent to the guillotine without proper trial, prompting English caricaturists to stereotype the French as blood-thirsty. This stereotype was reinforced visually by the violent attributes with which French characters were portrayed. 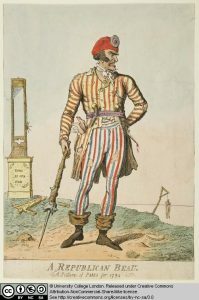 In the caricature of the man, A Republican Beau, the sans-culotte wears a tattered suit with patriotic French colours of red, white and blue, topped with a liberty cap. To his left is a guillotine, on which is proclaimed ‘THIS IS OUR GOD’. He is armed with a bloody dagger, two pistols and a spiked club. From a side pocket protrudes the body of a child, labelled, “for stew.” The female equivalent, A Republican Belle, is shown holding a dagger in one hand and a pistol in the other. She is the complete opposite of a traditional image of a respectable woman and proper mother. She shows no concern for her child and allows a pistol to discharge near it. The guillotine is feminised in this image by its display as jewellery, hanging on a necklace and earrings. Gruesome humour is everywhere. Attentive viewers will guess that the pub in the background is called The King’s Head, and here drinkers are playing skittles with the guillotine’s products. In both caricatures, bodies hang in the background and both central figures are shown with elongated jaws and sunken eyes, suggesting that the figures are subhuman. Both figures are intended to represent the dark depths of human nature that the Revolution uncovered. 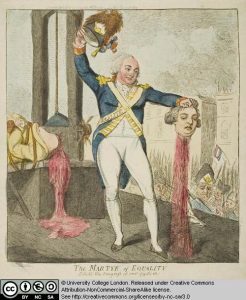 This print belongs to a body of images that played upon the fear that Robespierre’s henchmen’s hunger for human flesh and blood would only be sated when the whole world had been devoured. The etcher depicts one such follower on the point of gobbling up a sphere that is at once an orb (a symbol of kingship), and a globe – we see the continents marked on its surface. He is a truly terrifying figure, emaciated and dressed in ragged military uniform, he tramples underfoot all that is sacred, including a holy bible and crucifix, a bishop’s mitre and a crown. The scene is set in a barren landscape populated only by the head of a recently decapitated woman and scattered with skulls, many of which are piled up in the base of a monument, surmounted by a diminutive (and surely ironic) liberty bonnet and fasces. Engraved on its surface are the names of revolutionary politicians that served in the National Convention, whose building we see to the right. The inscription informs us that they are the founders of the Republic, declaring ‘La Patrie Reconnaissante’, ‘the Fatherland is grateful’, an ironic reference to the inscription on the pediment of the church of St Geneviève, recently renamed the Pantheon and dedicated to the memory of Great Frenchmen. Beneath this the reign of Robespierre is noted, as is the date that marked the beginning of the September massacres, one of the bloodiest episodes in the Revolution’s history. 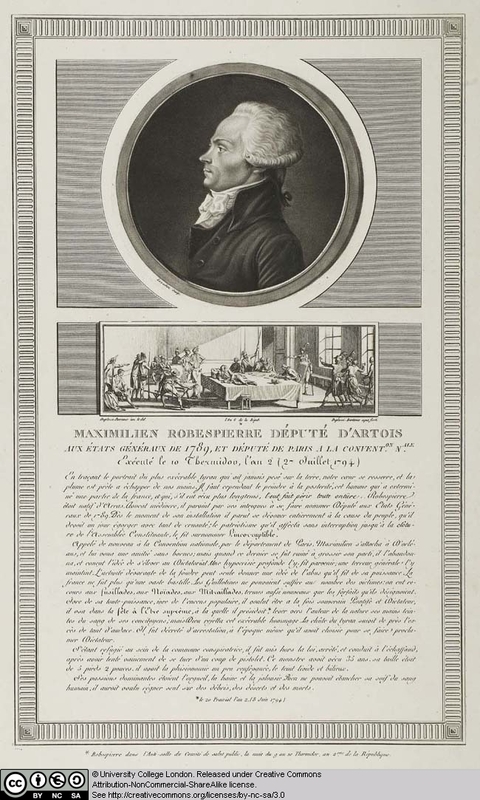 The reference to cannibalism helps to date the print to the period immediately following Robespierre’s fall in July 1794, when the backlash against his rule began. This most inhuman and incomprehensible of crimes was frequently evoked by orators and artists trying to discredit and make abhorrent the recent regime. Interestingly, this etcher refuses to let his audience be complacent: the use of the future tense in his title, and the caption that follows the curve of the globe, ‘il y passera’, ‘so it will pass’, functions as a call to arms to destroy such monsters before they destroy you. The Tableaux historiques de la Révolution française was without doubt one of the most significant artistic achievements of the revolutionary period, set apart from other print series commemorating the events of the Revolution by virtue of the numbers of engravings included in it, their size, and their exceptional artistic standard. This inevitably kept their cost high and limited their distribution. 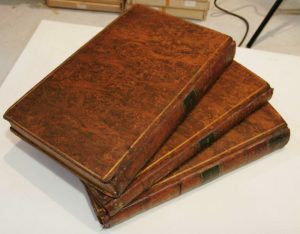 Yet between 1791 and 1817, five editions of it were printed, and each was extended beyond the quantity originally advertised, suggesting a great demand for such luxury editions: commercially speaking, the Tableaux were hugely successful. The Tableaux consisted of a numbered series of engravings illustrating dramatic moments from the Revolution, each accompanied by a four page written narrative. The 145 engravings included in the different editions were the result of the collaboration of a large number of artists attached to the project at one point or another during its sixteen-year history. In the edition of 1802 a series of 60 portraits of the period’s protagonists was added, each of which followed the same format, of a portrait roundel by Charles François Gabriel Levachez, and a vignette by Jean Duplessi-Bertaux depicting the defining moment of their life. Below them, a short discourse extolled the virtues or crimes of the subject. At first glance the engravings have a documentary quality and appear visually accurate and topographically precise depictions of particular events. Their truth would seem to be corroborated by the fact that Jean-Baptiste Prieur, who executed the first 48 tableaux, claimed to have been an eye witness at, and even to have participated in some of the events he depicted. However many of the scenes were manipulated, not just with an eye to composition or the creation of visual drama for example, but to express specific ideas about the nature of the event. Far from simply depicting moments from the Revolution, these prints actively construct them. Thus, as regimes changed and theTableaux were reprinted so alterations to the series were made in order to reflect changing attitudes towards events in the recent past. Remarkably, editions of the Tableaux date to the periods of the Terror, the Directoire, the Consulat, Empire and Restoration . The study of these different editions, which has been most comprehensively and meticulously undertaken by the French-Canadian scholar, Claudette Hould, therefore provides a fascinating way of tracing shifting attitudes towards the events and the people that they depict. Swebach-Desfontaines’ tableau, (the 72nd in the series), depicts the first of the massacres that took place in Parisian prisons between the 2nd and the 5th September 1792 (not, as the print suggests, between the 2nd and the 6th). The killing spree had been sparked off by the fear of the Austrian army’s impending arrival in Paris following the French defeats at Longwy and Verdun. Believing the Revolution was in imminent danger, the Paris Commune (the radicalised municipal government) urged the city’s sans-culottes to enact popular justice and target the republic’s enemies still at large in the city. Marat also fuelled the public frenzy with his usual effectiveness, before pointing the mob in the direction of the Paris jails, urging them to seize the priests, Swiss guards and their accomplices held there and ‘run them through with a sword’. The mob carried out his instructions faithfully, going first to the Abbey prison and then proceeding to the Carmelite convent where some 150 prisoners were being held. Over the following days, other prisons fell victim to the violence, which claimed the lives of between 1,000 and 1,500 men and women. Even if the government had wished to intervene and put a stop to matters (and different factions within the government took different points of view), they were powerless to do so, for it was the Commune that controlled the actions of the people. Swebach-Desfontaines has depicted the massacre at the Abbey prison: a few sans-culottes armed with clubs can be seen beating their victims; bodies lie scattered in the foreground; a decapitated head, mounted on a pike, is paraded amongst the crowd. Certainly he has not shied away from the grisly facts of the episode. Yet the drama remains understated and the representation toned-down: there is little sense of revolutionary frenzy, and as Warren Roberts has noted, should the bodies be removed from the composition, all that one would be left with is a crowd idly milling around. Given the anxieties that surrounded the power of the people, which had on this occasion escaped the control of the revolutionary authorities and manifested itself in the most alarming way possible, it is little wonder that Swebach-Desfontaines created what is a cool, dispassionate representation of events. Above all the Tableaux historiques was a commercial project: an image depicting the reality of a ragged and enraged crowd might easily have alienated subscribers reluctant to be reminded of the bloody excesses inspired by the Revolution. A notable characteristic of the Tableaux historiques series is the topographical accuracy with which the settings for events are rendered. In this case Giradet’s accuracy can be measured against the building of the Pantheon, whose dome still dominants the Paris skyline today. In other instances the prints are rendered doubly interesting to architectural historians because they remain valuable records of places long since demolished: the Abbey prison, for example, was destroyed in 1854. Yet the artists involved with the project were not above the subtle manipulation of their settings for artistic or ideological effect. In this instance the size of the Pantheon is accentuated by the way Giradet has aligned different elements such as the statue of Rousseau in the foreground on the same axis as the flag fluttering from the dome so that it the building looms majestically over the foreground scene, and is endowed with an air of grandeur and authority. The skyline drops the nearer it gets to the Pantheon building, which seems all the more massive as a result. In 1791 Soufflot’s church of Saint Geneviève had been secularised and re-dedicated to the memory of Great Men. The inscription added to the pediment at this point (and legible in Girardet’s design) reads, ‘Aux Grands Hommes La Patrie Reconnaisante’ – ‘To Great Men, the Fatherland is Grateful’. ’ During the Revolution, a number of ‘Pantheonisations’ were planned, including that of the revolutionary ‘martyrs’ Le Pelletier, Marat, and Bara, (although, because remains could only be translated to the Pantheon ten years after death, none of these were actually carried out). In this instance it is Jean-Jacques Rousseau who is accorded the singular honour of being pantheonised, an event that took place with much fanfare on the 11th October 1794. This print bears witness to the elaborate ceremony that surrounded such an occasion and the huge number of people involved: we see a procession snaking its way to the massive doors of the Pantheon. Typically the communal ceremonies and festivals that punctuated the French revolutionary calendar looked to the world of classical antiquity for visual and ideological inspiration. In this instance note the classical dress worn by those bearing the model of Rousseau seated in the shade of a tree or the Roman-inspired standards carried by others in the procession. 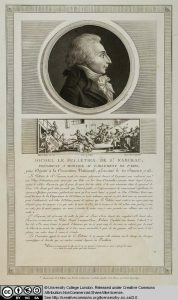 The publication of the portrait of Le Pelletier was advertised in the Journal général de la littérature de France, in Messidor an 7 (20th June – 19th July 1799), issue no. VII. It formed part of the 5th instalment of portraits, which would eventually be included in the third volume of the edition of 1802. Le Pelletier is instantly recognisable as a result of Le Vachez’s decision to show the deputy from the side, allowing him to delineate his very distinct profile. Below, the scene of Le Pelletier’s murder at the hands of Paris unfolds in dramatic fashion, and despite its small scale, there is much within it to engage the viewer both visually and emotionally. The tableau is dynamically composed, with strong diagonal emphases; the column of light and the staircase, which cut through the picture plane, draw the viewer deep into the scene and create a sense of spatial depth. Duplessi-Bertaux has focused the drama on the moment when Le Pelletier was stabbed, showing the body of the deputy swooning out towards the viewer, his arms outstretched in an imploring gesture. The scene is well populated with characters not integral to the story but which allow Duplessi-Bertaux to convey a range of reactions (all expressing horror and fear) at what has taken place, and which help create much visual interest. Some men and women rush towards the deputy, some try to flee, others, frozen on the spot, hold up their arms in dismay at his murder. The accompanying text indicates that we are meant to share their remorse at the murder of one so good. It opens with the statement that Le Pelletier was a man of gentle manners who had campaigned for the abolition of the death penalty. He had nevertheless voted for the execution of the king, but by his account only because he believed it in the public interest and necessary for the strengthening of the republican government. Yet the text expresses some ambiguity about his motivations for having so voted, and the rumour that he had sold his suffrage to the Duc d’Orleans (another regicide) in return for the favours of his family, is recounted here. This ambiguity may denote the fact that regicides such as Le Pelletier were viewed with increasing ambivalence at the time of the publication of this print. The overall tone of this engraving is sympathetic towards Corday, who in Le Vachez’s portrait is depicted as a beautiful, natural woman, her long curls falling about her shoulders. In keeping with this, Duplessi-Bertaux has distanced Corday from the act that made her famous. Rather than showing her as she stabs Marat, which might have drawn attention to her capacity for violence and compromised her femininity, she is portrayed in the moments afterwards, when she is herself about to become the victim. The scene for her arrest is set and a large crowd of armed men bursts through the door take her away. In this vignette we see Duplessi-Bertaux at his most theatrical, making use of exaggerated gesture to convey the character of the different personages depicted – Corday, head held high, defiantly rests her hand against the side of the bath, as if claiming agency for the act. Marat’s body is grotesquely slumped and his servants hold their hands aloft in horror. The guards enter with purposeful strides. The use of exaggerated gesture was perhaps especially necessary given the diminutive size of the characters. Yet Duplessi-Bertaux seems to play self-consciously with the dramatic potential of the scene. On the left hand side is a curtain that has been pulled back to let us see the drama with its heroine centre-stage. Corday’s strong and virtuous character is described in glowing terms in the accompanying discourse, and her decision to come to Paris to kill Marat is contextualised. Yet its author holds back from justifying her actions, and in the final sentence notes that her memory has passed into posterity like those of all the guilty, ‘for one cannot pardon the assassin, even that of Marat.’ This disclaimer sits awkwardly with the rest of the text, and we can only think that it was added to bring the print in line with official opinions, rather than with the, by then, widely held beliefs about Corday. ‘Marat! What a name, what a man … or more like, what a monster!’ So opens the text written to accompany Marat’s portrait and illustrative vignette, in which he is described as hideous of body and of mind, (‘a ferocious being’, ‘an evil scum vomited forth by the Revolution’). ‘Who knows how far his thirst for blood would have carried him?’ it asks the reader. Yet this will always remain a rhetorical question for, the text continues, a ‘heroine’, Charlotte Corday, freed the earth from him when she stabbed him in his bathtub on July 13th 1793. 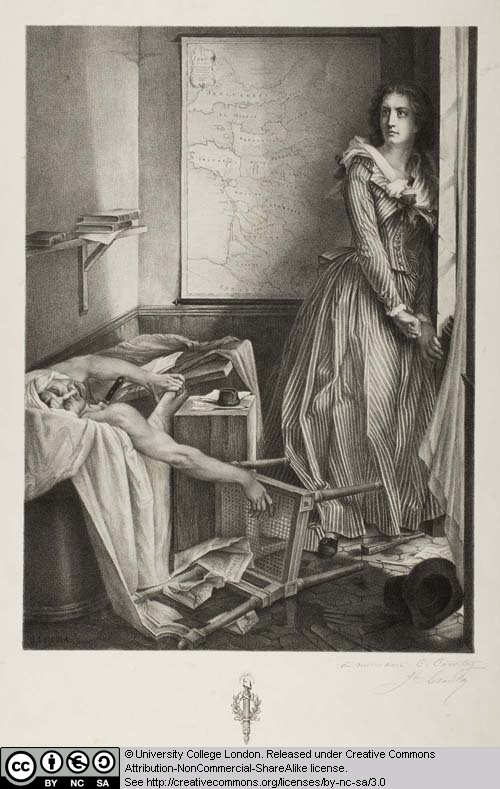 Any reserve tempering the otherwise celebratory discourse written to accompany the print in this series depicting Corday is abandoned when discussing the reviled Marat! Little of Marat’s ‘vile’ character is perceptible from his portrait, which, if anything, depicts him in a favourable light. He is shown in the motion of turning his head to towards something that has caught his attention or imagination, a pose that suggests not only lively interest, but according to eighteenth-century pictorial conventions, inspiration. The fact that his forehead is illuminated by light from an unidentified source also suggests the workings of an active, intelligent mind. Marat is portrayed in his trademark turban, worn for medicinal purposes, yet no mark of illness is visible on his countenance: on the contrary, he is shown healthy and strong. This discrepancy between written and visual portrayal could result from the fact that Levachez’s portraits were usually posthumous and he had to draw on existing imagery. In Marat’s case the bulk of this was produced in the wake of his death to glorify the martyred Marat for a radical audience. Interestingly Duplessi-Bertaux also chose to depict Marat in a triumphant moment, namely when he was found innocent of the charges brought against him by the Girondins on 24th April 1793. We see him carried aloft by a huge crowd who had gathered to celebrate the victory of the Friend of the People. This, and ironically, his murder, (which conferred on him the glorious status of a martyr of the Revolution), were the high points of Marat’s revolutionary career. Might Duplessi-Bertaux have chosen to depict his acquittal instead of his murder because the latter scene was used in the print of Corday? 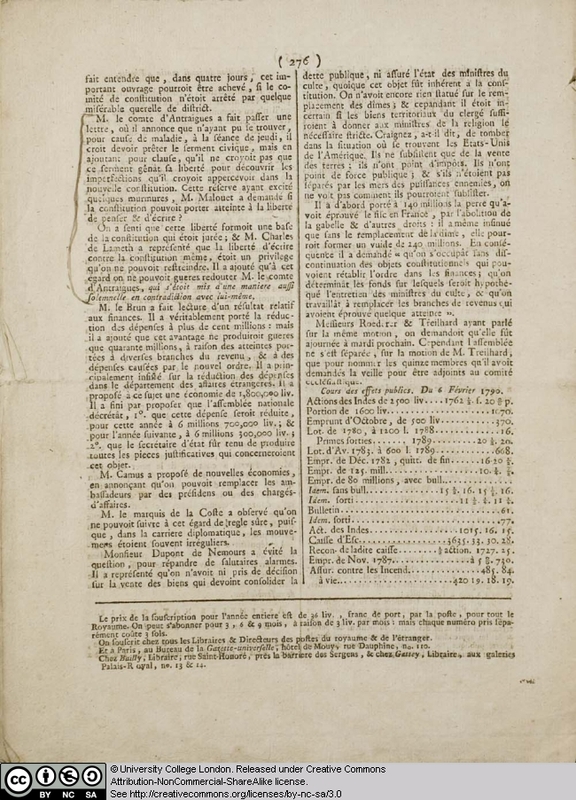 After all the two prints were issued for purchase as a pair, as advertised in the Journal général de la Littérature de France in Nivôse an VII (December 1798/January 1799). In the vignette accompanying the discourse, Duplessi-Bertaux has depicted the (appropriately) grisly last hours in the life of the Revolution’s most notorious protagonist who, in the end, could not escape the justice of Madame Guillotine. He is shown prostrate and powerless, lying where he fell after his failed suicide attempt, during which he succeeded only in removing his own jaw with a pistol shot. The terrible state of Robespierre, not visible in the tiny image, is succinctly conveyed by the reactions of the men who have just entered the room and who throw their hands up in alarm at the sight of him. Entering from the left are men carrying a stretcher, presumably to convey him to his trial and, following that, his execution. 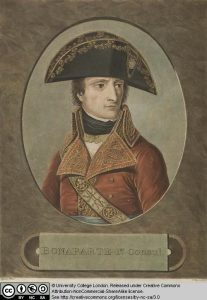 Le Vachez’ portrait of Robespierre was modelled on the one included in the series, Portraits des personnages célèbres de la Révolution, an exhaustive compilation of 200 subjects edited by François Bonneville. First printed in 1793, Bonneville’s series was later extended and republished first in 1796 and then again in 1802. Andrea Appiani was chosen by Napoleon to be the official painter of the Imperial court, so it is safe to assume that the painting from which this print is derived, had its subject’s seal of approval. Appiani’s depiction of the First Consul is as a dashing young general, resplendent in his red velvet and gold brocade uniform. Alert and resolute, he looks to the left, as if his attention has been caught by something in his line of view. This characterises Napoleon as a quick-thinking , tactical military genius, whose power and precision on the battlefield is evoked by the stylised thunderbolt motifs on his sword strap: these are of a type that often feature in classical representations of the god, Jupiter. A small tricolour cockade tucked into his hatband acts as a reminder that, as First Consul, Napoleon upheld and extended the legacy of the French Revolution and suggests that he will strike down the enemies of the Republic. The First Consul’s portrait is set into a trompe l’oeil marble surround. Note the way that the artist has tried to suggest its three-dimensionality through the use of shadow on the inside edge of the frame. It is as if we were looking through a real marble frame into a different space, occupied by Napoleon. The print, which is of a high quality and very sensitively coloured by hand, would have found an eager audience. During the Consulat, Napoleon was at the height of his popularity and there would have been a considerable demand for depictions of him, particularly in his most popular guise as military hero. Its high quality however, would have limited its distribution to those with at least a moderate income. Letoula’s lithograph is a faithful rendering of Paul Baudry’s large-scale (203 x 154cms) painting of Charlotte Corday executed in 1860 and exhibited at the annual Paris Salon exhibition the following year. It is a heroic representation of Corday, a subject popular throughout the nineteenth century with historians, poets, painters and their audiences, for whom she was something of a national icon. She was often compared with Joan of Arc who also ‘saved’ the nation from a murderous tyrant. This idea is reinforced by Baudry who frames Corday’s figure against a map of France, connecting her actions with the good of the nation on whose behalf she acted. Corday is depicted in the moments immediately following her murder of Marat, whose left hand grips the edge of the bathtub, suggesting he is still alive. Similarly, Corday’s hand maintains the position it would have held as she clutched the knife, now embedded in Marat’s chest. The disjointed appearance of her right arm and hand is expressive of her shock at having committed the deed and of her fearful anticipation of its repercussions, the latter emotion also expressed by her left hand, which grips the wall. Her goal accomplished, she awaits arrest: the shadows cast by the window frame evoke the bars behind which she will be imprisoned before her execution. Corday’s upright figure, physical beauty, and stoicism stand in marked contrast to the artist’s foreshortened and awkward depiction of Marat, his face contorted with pain and frozen in an ugly grimace as he breathes his last, leaving us in no doubt where our sympathies should lie. When exhibited in Paris, the painting attracted much negative press from the art critics in attendance, who believed that the artist’s inclusion of many incidental details, such as signs of the struggle, detracted from the magnificence of Corday’s act, so that it became anecdotal, incidental, literal, and worst of all conventional. Additionally, the overt theatricality of the work elicited complaints that, loaded with sentiment, it was more likely to arouse cheap emotions in its public audience, than the more noble thoughts appropriate to the subject. It was, however, exactly the public appeal of the painting that made it a strong candidate for reproduction, and Letoula could anticipate that his lithograph would find a ready audience. Jeremy D. Popkin, Revolutionary News: The Press in France, 1789 – 1799, Durham and London, 1990, p. 121. Interestingly, it was the number of such counter-revolutionary plots to ‘save’ the king that provided him with the impetus to pronounce his loyalty to the Constitution, for fear of being branded counter-revolutionary himself. Favras was found guilty of treason and hung on 19th February, twelve days after this edition of the Gazette Universelle was printed, see William Doyle, The Oxford History of the French Revolution, Oxford, 1990. Rolf Reichardt, ‘Prints: Images of the Bastille’, in Darnton and Roche (ed. ), Revolution in Print: The Press in France, 1775 – 1800, Los Angeles, London, 1989, p. 230. See Dominique Godineau, The Women of Paris and their French Revolution, trans Katheine Streip, Berkeley, Los Angeles, London, 1988, pp.166 – 168. Richard Taws, Currencies: Circulation and Spectatorship in the Print Culture of the French Revolution, Unpublished thesis (PhD), University of London, 2005. I would like to thank Richard for his assistance whilst compiling this entry. 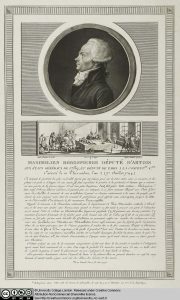 Claudette Hould, La Révolution par la Gravure: les Tableaux historiques de la Révolution française, un entreprise éditoriale d’information et sa diffusion en Europe (1791 – 1817), ex. cat. 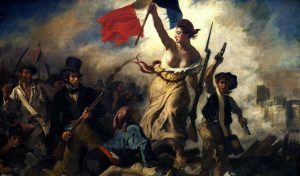 Musée de la Révolution française, Vizille, 2002; Claudette Hould, La Révolution par l’Écriture: les Tableaux historiques de la Révolution française, ue entreprise éditorial d’information (1791 – 1817), Vizille, Paris, 2005. Warren Roberts, Jacques-Louis David and Jean-Louis Prieur: Revolutionary Artists, New York, 2000, p.181 – 2. Claudette Hould, La Révolution par la Gravure: les Tableaux historiques de la Révolution française, un entreprise éditoriale d’information et sa diffusion en Europe (1791 – 1817), ex. cat. Musée de la Révolution française, Vizille, 2002. Originally published by University College London Art Museum under the terms of a Creative Commons Attribution-NonCommercial-ShareAlike 3.0 Unported license. This entry was posted in Art History, France, French, French Revolution, History. Bookmark the permalink.